A Tawny Port is a blend of older vintage wines, displaying a rich amber color. Tawnies typically lie on the slightly sweeter side of the spectrum. As a tawny port spends more time in oak, its color starts to fade from ruby red to more ruby-orange or a "brick red," often reaching a deep amber or mahogany color by the time it's matured. As the aging process continues, a Tawny's taste will become nuttier and the flavors develop the rich flavors of caramelized figs, dates and prunes compared to the fresh fruit factors found in a Ruby Port. On the label, the age is most commonly designated as 10, 20, 30 or 40 years. 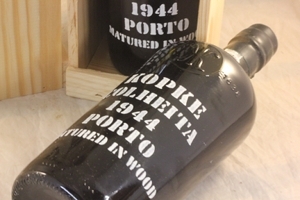 These year designations are the average compilation of various vintages used in the Tawny Port blend, not the exact years the wine has been aged as a whole. Unfiltered LBVÕs, if stored in refrigeration after the bottle has been opened, will normally provide shelf life of a week or two. For filtered LBVs, these typically can last up to ten days after being open, without any major deterioration of quality.